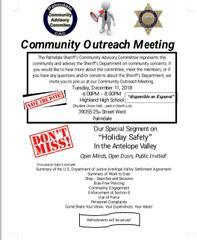 Antelope Valley residents are invited tomorrow night (Tuesday, December, 10, 2018; 6-pm-8pm) to join the Community Advisory Committee and Palmdale's Sheriff Station for out quarterly outreach meeting. Get to know your community leaders, department members, and city officials. Topics will include bias-free policing, community engagement, searches & seizures, personnel complaints, summary of year. Come share your views, experiences and ideas.